I’m going to drag my kids ( a couple of which run XC) over to the state meet to support some locals. Never been there before. Does anybody have any good tips for parking, viewing, food, etc…? I’d recommend staying close to the start because the race loops around near there a few times and there are just too many people to be able to move around much. They don’t do this course anymore. Since both genders do 5Ks now, they only have one lap around the pond and then they run around in the swamplands before going up the hill in the forest. at the southeast end of St. Olaf campus. Large red signs will direct spectators to these lots. Shuttle service to and from campus will be provided from 9:00 am to 5:00 pm on race day. The pickup and drop off points will be posted with large red “Bus Stop” signs. Please note: Spectator parking is not allowed in any of the Skoglund Athletic Center parking lots. 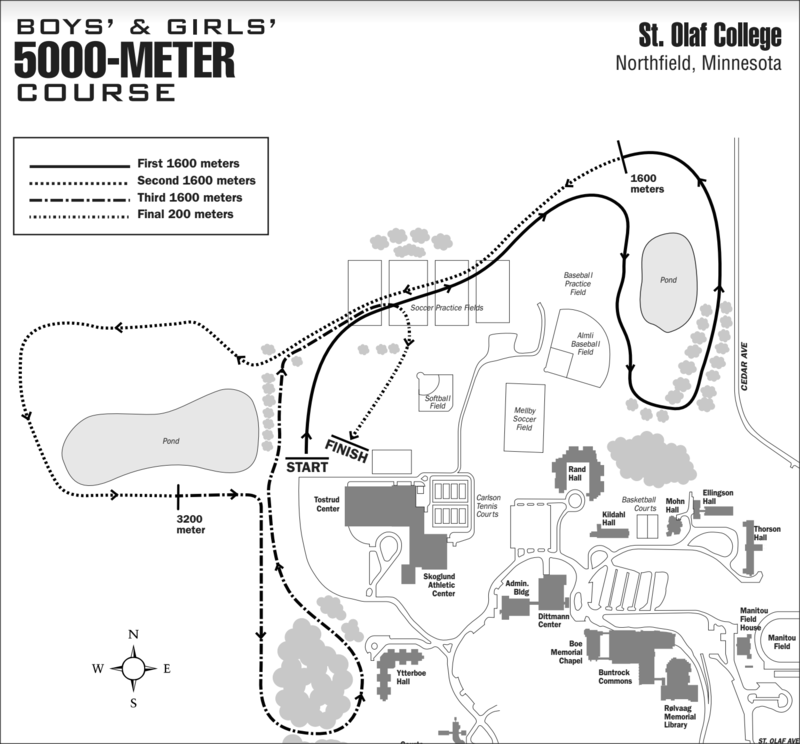 DIRECTIONS TO ST. OLAF. 35W south to Minnesota Highway 19, go east on 19 to Northfield and follow the Saint Olaf College signage. Alternative routes include Cedar (77) and Highway 3 out of St. Paul. Do they still have that wood chip trail on the course? I remember racing there in college back in the early '80s and picking up a big chunk of wood in my spikes that I couldn’t dislodge…I ended up taking a spill on a corner because the spikes couldn’t grab turf.